“Apple Juice is an underground classic skateboarding documentary shot by Skate NYC locals from the late 80’s early 90’s. Skate NYC is a legendary skateboard store that was on Ave A and 9th St. in the East Village in NY from 1986-91. Blueprint Skateboard‘s newest am, killing it in this video part from Tiltmode Army. A compilation of Nate Keegan that Jason Jenkins put together last summer. A montage featuring Boston spots & skaters, from the last EST video. 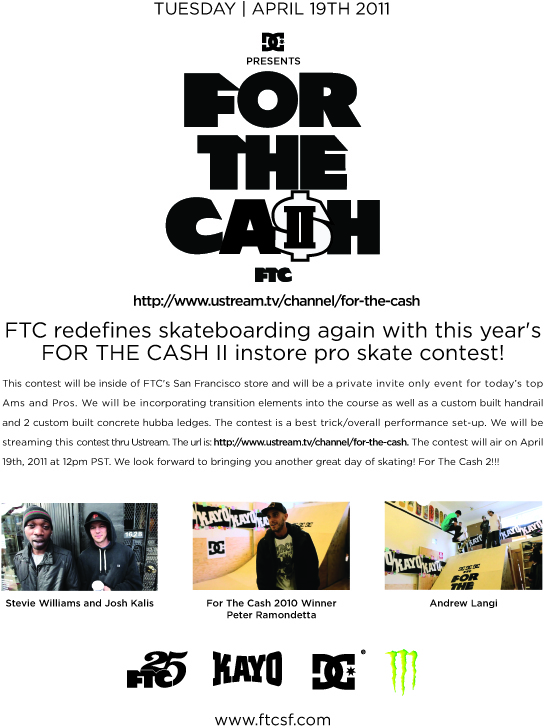 FTC, DC Shoes, Kayo, & Monster are putting on FOR THE CASH 2 contest, a FTC SF in store contest. Tomorrow, streaming live on ustream, 12pm PST (3pm EST). A few of the Blueprint guys put it down at The Berrics. Fresh off his Sea Level video part, Frankie puts it down again for Orchard Skateshop. The word “remix” doesn’t really do it justice. It’s a full part with new footage as opposed to the short part in Madness. New video part from Lavar McBride courtesy of 48 Blocks. A day in the life 8mm short starring Jabari Pendleton. Filmed and edited by Zack Mack.